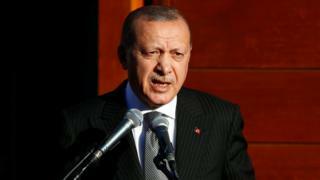 Turkish President Recep Tayyip Erdogan has ended a visit to Germany by opening one of Europe’s largest mosques. A major police operation was in place for Mr Erdogan’s visit to Cologne, which has a large Turkish community. But plans for up to 25,000 people to be allowed to gather outside the mosque were cancelled by city authorities cancelled over safety fears. 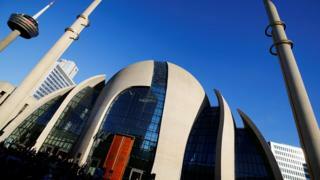 Cologne’s Central Mosque was built by an Islamic religious group with close ties to the Turkish state. 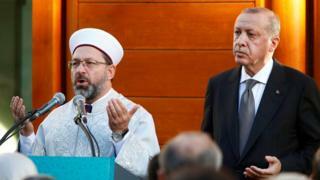 The aim of Mr Erdogan’s trip was to ease tensions between the two countries. In depth: What’s Erdogan’s Turkey like? “We need to put aside our differences and focus on our common interests,” he said. But the trip also highlighted differences on issues including Turkey’s crackdown after the failed coup attempt of 2016. 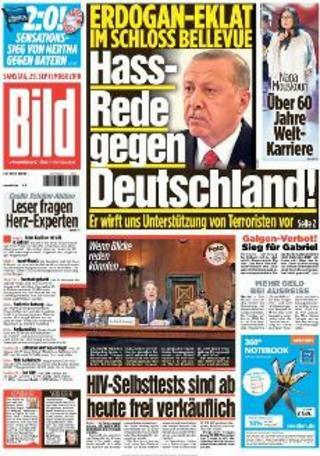 Germany’s best-selling newspaper Bild picked up on the remarks and was critical of Mr Erdogan. 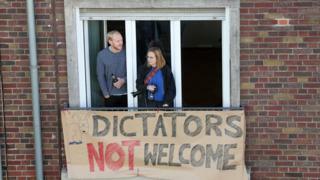 It emblazoned its front page on Saturday with the words “Hate speech against Germany”. But he used the occasion to urge Mrs Merkel to extradite critics of his government – known as Gulenists – that he sees as “terrorists”. The chairman of the German parliament’s foreign affairs committee, Norbert Roettgen, told the Funke newspaper group that “the timing of this visit was wrong – it was far too early”.